MOCCASIN, Arizona – Pickup trucks and horse trailers filled the parking lot and stretched down the street next to a community park in Moccasin, Arizona, Friday, as concerned ranchers and representatives from agencies like the Arizona Farm Bureau and the Arizona Game and Fish Department gathered together. Their aim? Fighting to save a way of life they say is being threatened. “They’re backing the ranchers into a corner, and you’re going to see a lot of Cliven Bundys out there,” Bill Gubler, a rancher from Santa Clara, said. Gubler currently ranches on the Arizona Strip and has cattle grazing allotments there, as do many of the people who were in attendance at the meeting. They say the generations-old practice of grazing cattle and ranching on the Arizona Strip is currently being threatened by a proposal that would designate 1.7 million acres of Arizona land as a national monument. The proposed Grand Canyon Watershed National Monument would include lands on the Arizona Strip as well as the North Kaibab and Tusayan Ranger Districts of the Kaibab National Forest. Once designated a national monument, these lands would be subject to all the federal restrictions associated with that designation. 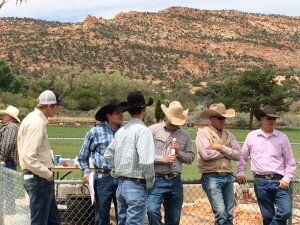 Rodgers said ranchers are being told grazing can continue once the land is designated a national monument – but, historically, national monument designation in other locations has effectively tied ranchers’ hands, restricting their abilities to effectively do business. National monument designation has also led to the degradation of lands the designation was supposedly put in place to protect. “There’s not any other instances where grazing has been able to function effectively as a business (once a national monument has been designated),” Rodgers said. Another national monument where cattlemen say this has happened is located just north of the Arizona border, at the Grand Staircase-Escalante National Monument in Utah. Grand Staircase-Escalante was designated a national monument by President Bill Clinton in the 1990s. Existing livestock grazing permits were allowed to stay in force at the monument when the designation went into effect, but ranchers who graze their cattle there say the restrictions and policies that came with the designation have made ranching difficult – from water improvement restrictions to transportation restrictions. It is feared – and believed – the same thing will happen if the Grand Canyon Watershed National Monument is approved. One thing national monument restrictions prevent ranchers from doing is creating and maintaining water systems, Rodgers said, such as drilling wells or installing pipe systems to bring groundwater to their cattle, and then performing the needed maintenance once those water structures are in place. Primary groups advocating for the monument to be established are environmental organizations like the Sierra Club, citing the protection of ecosystems and species as reasons the monument should be designated. Craig Johnson, of Cane Beds, Arizona, is a lifelong rancher who studied ranching in college. He said what most people don’t realize is ranchers are the primary land stewards in the areas where their cattle graze, and the ranchers’ efforts and oversight benefit the land and the wildlife living there. Without cattle grazing, he said, cheat grass quickly gets out of control, for example, which creates wildfire hazards, ultimately costing millions of dollars. Additionally, water resources created and maintained by ranchers not only supply water to cattle but also to wildlife living in the grazing areas. “You lose the water, you lose the wildlife,” Johnson said. Those opposed to the Grand Canyon Watershed National Monument fear President Barack Obama will establish the monument by executive order, which would bypass any chance for Arizona residents and representatives, and others who would be affected by the designation, to provide feedback in the matter. 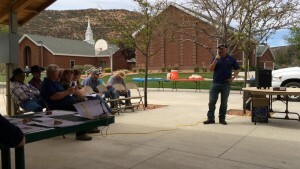 “This land grab is not good for any of us,” Donn Pillmore, director of Arizona Strip operations for Energy Fuels Resources, said to the crowd assembled in Moccasin on Friday. Pillmore spoke of mining restrictions that would result from the monument designation. He said some of the richest uranium deposits in the country exist in the area where the monument is being planned. Not only will the United States lose these rich mining resources, he said, but thousands of local people who make their livelihoods through mining will find themselves out of work. Pillmore said the people who are advocating for the monument are primarily East Coast residents who don’t live locally and don’t know or work the land, but they are shown propaganda photos of the Grand Canyon and are told the miners are going to ruin it. They are similarly told cattle grazing is destroying the land. “The main drive now for these environmental groups is to make it a monument so mining can’t happen again,” Pillmore said. Pillmore added that in areas where uranium mining has occurred in the past, you’d never know a mine was ever located there. In the face of impending changes, he said, his company will be moving its mining operations to the south side of the Grand Canyon in July. Christy Davis, Arizona Farm Bureau field service manager over five Arizona counties – Coconino, Yavapai, Mohave, La Paz and Maricopa – said the proposed monument will affect tourism and hunting as well as mining and ranching. Historical practice has shown us that in designating these monuments, they say that nothing will change, that management of that land will not change. But what happens – historical practice shows us that it does change. They may start out in one direction, but then it goes into another. So, they may start out saying that we’re going to continue to allow you grazing, but then they cut your access off. Then they cut your ability to get to your cattle, to improve those lands, to do things to make sure that you’re doing things efficiently to be that cattleman on the market. They take those things away from you. So, they basically smoke you out. They make sure that you cannot do what you need to do in order to run that business. Davis said the only chance of fighting the monument is for facts to be brought to the public’s attention and for concerned citizens to write letters expressing their opposition to the monument. The Sierra Club had its members send thousands of preprinted postcards to Arizona Congresswoman Ann Kirkpatrick advocating for the monument, she said. Those opposed to the monument need to match those efforts by writing “good, heartfelt letters” expressing their opposition and the reasons behind it. “Sen. (John) McCain said to us in a public meeting, ‘If I can wave 2,000 letters in the air while I am debating this on the Senate floor, that’s better than a phone call. Call me, yes – but send me a letter. Tell me why,’” Davis said. This makes me so mad I could spit nails! Go away federal government! GET OUT! GO AWAY! You are pushing people to the point where they have to do something to save their lives and their way of making a living. 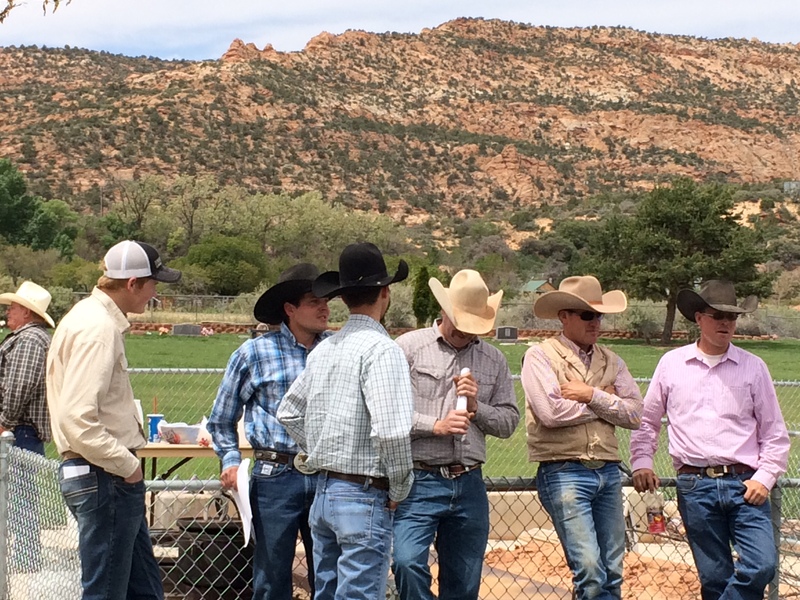 You don’t want a Cliven Bundy type of event you say but you keep doing things like this. You BLM did criminal things to my family in New Mexico. You used the force of government to get away with it. I won’t go into details but this whole thing is very personal with me. I stand with with Mr. lyman in San Juan county and with the Bundy’s . I stand with my friends and neighbors in the water fight in the Jemez mountains in New Mexico. THERE IS NO JUMPING MOUSE THERE! You are making that up for your reasons. We are not criminals. You are the grabbers and cheaters and liars. I have heard and seen you do those things in court. You have no conscience. That raid you visited on innocent people in Blanding several years ago was uncalled for and is not forgotten. I descend from American Indians and Spanish settlers and Scots Irish pioneers in this western country. This is my homeland. I will not be pushed out. I know the story of my ancestors problems in Scotland. I know what happened to my poor Mexican ancestors. I will stand up. ” A man’s a man for A that.” Robert Burns. Thank you St George news for covering the story and for giving we the people the freedom of speech our constitution guarantees. Ranching is horribly destructive and does not belong in the desert. Just because people have done something for an amount of time isnt a valid reason to continue to do something. Sorry. I’m rooting for the monument. You must be a vegan? Please don’t infringe on my right to eat meat. ” their way of making a living” is mooching off the American taxpayer by paying below market prices for their grazing privileges on public lands. Same thing in New Mexico, native. You must have been one of those freeloaders too. Just because it has gone on for 100+ years doesn’t make it right. Ranching is dying in this part of the country, and it should be. Get over it. Find a real job. The cattle ARE ruinjing those lands. It’s not grass. It’s sparse weeds, sagebrush and cactus. Those ranchers have had a good deal for years: $1.53 a month to graze a cow and her calf. It costs us taxpayers much more to do upkeep and restoration on that land. Meanwhile, it’s only 4% of our beef. LAYTONIAN: you are horribly mis informed, the improvements to the regions the cattle are on are done at the ranchers expense, not the governments, the government restricts their ability to provide those improvements. anyone that thinks the cattle are destroying the land had better look at the land studies supporting the fact that when the cattle leave and the ranchers stop doing the improvements the health of the wildlife suffers. someone asked me once what did the wildlife do before all the improvements. simple they migrated. migration can’t happen the same way it did, now days, many of their water resources are being diverted into the cities, and large fences keeping them of the ROADs restrict the animals ability to follow the water and food sources. Cities and highways have been far more detrimental to the wildlife than a cattleman who love the land and hard work ever have been or will be. I’m on the cowboys’ side for this one. I support lots of environmental causes but the ranchers should win this one. There is a comment in here that does not have a supporting example. In the article this comment is not listed in quotes. It is stated as fact, but the “fact” is not backed up. There is a reference to Grand Staircase, but that is strictly about the regulations put in place on land that receives the National Monument designation. It does not reference “degradation of lands”. It is quite the accusation. If true, fine. This article does not back the statement up. Or, am I mistaken? Was this an opinion piece?